A hit-and-run accident is considered to be a very serious criminal offense. Prosecutors like nothing more than to convict a defendant who negligently or recklessly strikes a pedestrian, bicyclist or other vehicle. A hit-and-run driver will be fully prosecuted by the local district attorney’s office once apprehended. But not every culprit or defendant is identified. Few things can make the difficulty of suffering serious injuries in a motor vehicle worse than not knowing the identity of the driver who injured you. This unknown complicates the process of pursuing compensation, but our skilled and experienced lawyers will guide use all of their tools in our tool box to achieve the full compensation that you need and deserve for your speedy recovery. The most common cause of hit-and-run accidents is from drivers who are distracted and not paying attention to the road or surroundings. A close second to the first cause, is being impaired, intoxicated or under the influence of some drug or hallucinogenic. The defendant driver who flees from the scene of the hit-and-run accident may be prosecuted as either a misdemeanor or a felony depending upon the severity or injuries. If the hit-and-run driver does not have any liability insurance coverage then we start out getting our client signed up for the victim’s assistance restitution program with the District Attorney’s Office, but that should be the last resort. It is preferable that the criminal defendant be apprehended so that we can prove negligence in a civil lawsuit for substantial monetary damages against the negligent party or the party who entrusted the defendant to drive the vehicle involved in the accident. 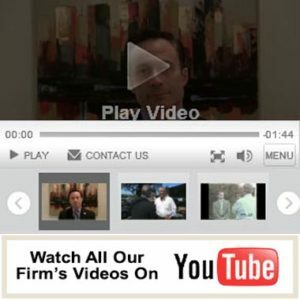 Our personal injury attorneys are determined to hold fully responsible the negligent party so that you will receive the maximum compensation from the negligent party or parties for all of your medical costs, expenses, lost wages, future wages, and pain and suffering due to the hit-and-run accident. We are prepared to pursue any form of legal action against the responsible and negligent parties to ensure our hit-and-run accident clients the most favorable compensation obtained under the law. HIIRE THE BEST INVESTIGATORS/ EXPERTS: This law firm and its team of dedicated and compassionate personal injury attorneys do not leave any stone unturned and to that effect we hire top-notch private investigators to gather the appropriate evidence and facts against the negligent party which will be presented in court. We also perform background checks and investigations to determine the history of the defendant’s dangerous or negligent driving pattern so that we may hold the party liable to the full extent of the law for your injuries. We hire engineers who are able to recreate the accident scene and develop models and video evidence depicting the scene as it happened. This is very useful for jury trials and usually maximizes the end results. Our investigators interview eyewitnesses and accident reconstructionists to provide the strongest case possible in the event we have to go to trial on your behalf. YOU DON’T PAY UNTIL WE WIN: The Law Firm of Michael A. Fiumara works on a contingency fee basis which means that you pay no upfront costs. We get paid only after we win a settlement or jury verdict in your favor. If our clients lack adequate health coverage or their deductibles are high, we can arrange a lien method of payment with medical providers so that our clients receive the best care and treatment possible for a speedy recovery so that they can get on with their lives. IMMEDIATE ACTION AND MEDICAL CARE: Our hit-and-run accident personal injury attorneys commence work on your case immediately to ensure all medical treatments are available for our clients so that the opposing insurance carrier does not doubt the seriousness of our client’s injuries. We make certain that the medical services that we arrange by lien are performed by very qualified, top of the line, licensed medical professionals and are available to you regardless of the cost or duration of the ongoing treatment. UIM COVERAGE: Since we are very familiar with insurance law and the nuances of how the insurance industry works, we pursue compensation through your own insurance carrier until we can settle with the party who has the greatest fault. Most drivers have uninsured motorist (UIM) coverage as part of their automobile insurance policy. UIM coverage can be used to provide compensation for hit-and-run accidents. In many cases, this may be the only source of compensation available until which time we can find the negligent hit-and-run driver. When the hit-and-run driver is apprehended we also connect our client with the local district attorney’s office to provide our injured client with victim assistance monies and benefits where appropriate. Since our firm’s attorneys also have a strong background in criminal defense we can also guide our injured plaintiff clients through the criminal court process if necessary. E HANDLE EVERYTHING SO YOU DON’T NEED TO WORRY: To ease your pain and reduce your anxiety and stress please keep in mind that our experienced and compassionate accident attorneys completely manage the claims for compensation and reimbursement which allows our clients to concentrate on what is most important—getting the proper rest, treatment, ensuring a speedy recovery. COMMUNICATION AND CONVENIENCE: Our compassionate and dedicated hit-and-run accident personal injury attorneys are always available to travel to your home, medical facility, hospital or anywhere where it is convenient for us to discuss your legal options and to answer all of your questions. This law firm is more than ready to pursue any form of legal action against all negligent parties to achieve full compensation for all of your injuries. Our skilled and knowledgeable personal injury attorneys are motivated to achieve the most favorable resolution for you and, hence, make every effort applying every legal maneuver and tactic at our disposal to secure your full compensation in a timely manner. The Law Offices of Michael A. Fiumara is a client service-oriented law firm providing effective and aggressive representation for all of our clients leaving no stone unturned. Turn to the skilled and experienced attorneys at the Law Offices of Michael A. Fiumara to schedule a free initial consultation and case evaluation. You may call us 24/7.